The Don't Stop massage candle is nice; pretty container which can be reused, a lid to snuff the candle, a pour spout to make application easy, a light, snickerdoodley sort of scent and a long burn time. Made from natural oils and soy wax, it's a quality candle that just doesn't perform well for massage, turning too waxy and drying too quickly. This candle, while it really, really, really, really, realllyyy doesn't work as a massage candle, is just awesome to burn for its scent. I am absolutely in love with the subtle aroma and combination of scents and would gladly buy another one if they were available for sale. While it will definitely be a disappointment to anyone wanting to use it as a massage tool, it'll be a nice indulgence for the candle lover. And the jar is too cute for words! I wonder if I prayed to the EF gods really hard if they'd stock it? I'll pray to the gods too. I always wanted to try this. Maybe if we sacrifice a toy in their honor?? Aww too bad it's not good for a massage! Thanks for the review. thanks this was a very nice review I love the way it looks and the smell would be nice but not for that price if it is not good for massage. Looks like the vanilla is out of stock even though it's part of their promotions! Oh, well! Great review! Awesome review! Thanks a bunch! Thank you for a great, helpful review. Has a soy candle ever burned your skin? Candles-How much would you pay. 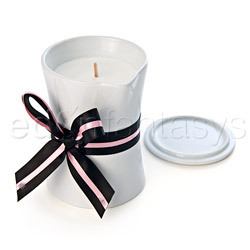 Thank you for viewing Don't stop massage candle – body massage candle review page!